Cancer vaccines, to date, have shown limited effect to control the growth of established tumors due largely to effector failure of the antitumor immune responses. Tumor lesion is characterized as chronic indolent inflammation in which the effector function of tumor-infiltrating lymphocytes (TILs) is severely impaired. In this study, we investigated whether the effector function of CD8 TILs could be rescued by converting the chronic inflammation milieu to acute inflammation within tumors. We found that injection of TLR3/9 ligands (polyI:C/CpG) into a tumor during the effector phase of lentivector (lv) immunization effectively rescued the function of lv-activated CD8 TILs and decreased the percentage of T regulatory within the tumor, resulting in a marked improvement in the antitumor efficacy of lv immunization. Mechanistically, rescue of the effector function of CD8 TILs by TLR3/9 ligands is most likely dependent on production, within a tumor, of type-1 IFN that can mature and activate tumor-infiltrating dendritic cells. The effector function of CD8 TILs could not be rescued in mice lacking intact type I IFN signaling. These findings have important implications for tumor immunotherapy, suggesting that type I IFN-mediated activation of tumor-infiltrating dendritic cells within a tumor will most likely restore/enhance the effector function of CD8 TILs and thus improve the antitumor efficacy of current cancer vaccines. To exploit the host immune system for cancer treatment, the rare tumor Ag-specific immune cells must be activated and expanded by cancer vaccines in lymphoid tissue (priming phase). These vaccine-activated tumor-specific immune cells must then migrate to the tumor, where they can exert their effector functions of cytokine production and tumoricidal activity (effector phase). Efforts directed at the priming phase have yielded many forms of peptide (1)-, dendritic cell (DC) (2)-, and gene-based (3–9) cancer vaccines that can break tolerance to self/tumor Ags and activate tumor-specific T cells. We have previously found that immunization with a recombinant lentivector (lv) is a powerful approach to activate tumor-specific CD8 T cells and generate life-long prevention of autochthonous melanoma in tumor-prone mice (10). However, despite the remarkable expansion and increase in Ag-specific immune cells observed in tumor infiltrates, the therapeutic effect of cancer vaccines remains limited in treating established tumors (11–14). Recent studies revealed that one of the main reasons that vaccine-induced immune responses fail to exhibit antitumor activity in the treatment of established tumors is failure of the effector phase within the tumor (15). We (16) and others (17, 18) found that vaccine-activated CD8 T cells lost their effector functions within the tumor, but retained function outside of the tumor environment, in the circulation and lymphoid tissues. This functional impairment of tumor-infiltrating lymphocytes (TILs) has also been reported in human tumors (19). Thus, a critical barrier to the success of cancer immunotherapy is at the effector phase within the tumor (20). Measures to rescue the effector functions of TILs within a tumor will therefore be critical for enhancing the antitumor effect of cancer vaccines. A tumor lesion is characterized as chronic indolent inflammation (21–23). A major characteristic shared by a chronically inflamed tumor lesion (16–18) and a chronic virus infection (24) is that the effector T cells in both settings are functionally impaired so are unable to either eradicate the tumor or resolve the infection. In contrast, acute virus infections can be quickly resolved when adaptive immunity is induced. Immunologically, the drastically different outcome between acute and chronic virus infections is most likely due to the different functional status of Ag-specific T cells (24, 25). Whereas virus Ag-specific T cells can effectively perform their function and eradicate pathogens in acute infection, the effector functions of Ag-specific T cells are lost in chronic viral infection (24). Similar to T cells in chronic virus infection, TILs lose their effector function within the tumor. Inspired by the demonstration of functional efficacy of immune effectors in acute virus infection, we hypothesize that conversion of the chronic inflammation milieu within a tumor to one of acute inflammation may rescue the effector function of TILs, and that some key molecules and signaling pathways in acute inflammation, but missing in tumors, are critical to rescue of the effector function(s) of TILs. To test this hypothesis, we studied whether induction of acute inflammation by intratumor (i.t) injection of TLR ligands (TLR-Ls) could rescue the effector function of CD8 TILs and enhance the antitumor effect of lv-based cancer vaccines. TLR 3/9 ligands (polyI:C/CpG) were selected because they have been shown to induce both an acute inflammatory response and high level of type I IFN (26, 27), thus mimicking acute viral infection. Although it may not be clinically applicable, induction of acute inflammation within a tumor provides a platform to investigate the key molecules involved in rescue of the function of TILs. We found that i.t injection of TLR3/9 ligands effectively rescued the effector function of TILs primed by cancer vaccine and decreased the percentage of T regulatory (Treg), resulting in marked enhancement of the antitumor effect of lv immunization. Rescue of TILs function was associated with effective Ag presentation by the tumor-infiltrating DCs (TIDCs), which were matured by local administration of TLR-Ls in a type I IFN-dependent manner. Type I IFN signaling within the tumor milieu is critical for efficient activation of TIDCs, the rescue of the effector function of TILs, and the outcome of tumor immunotherapy of cancer vaccines. Pmel transgenic mice were purchased from The Jackson Laboratory (Bar Harbor, ME). C57BL/6 mice were obtained from the National Cancer Institute (Frederick, MD) and The Jackson Laboratory. IFN-α/β receptor knockout (IFNα/βR−/−) mice were obtained from D. Moskophidis (28) of Georgia Regents University. All mice were housed under specific pathogen-free conditions within the Laboratory Animal Services. Animal care protocols were approved by the Institutional Animal Care and Use Committee of Georgia Regents University. B16F10 melanoma cells and 293T kidney cells were cultured in DMEM supplemented with 10% FBS. Tumors were generated by s.c. injection of B16F10 cells (2 × 105/50 μl) into the shaved flank of C57BL/6 mice. Recombinant lv, human gp100-lv (hgp100-lv), was prepared, and the titer was determined, as we previously described (10). For immunization, hgp100-lv (1.5 × 107 transduction units/50 μl) was injected s.c. in the footpad. Immunizations were carried out 5 d after tumor inoculation, when tumors were clearly visible. To induce acute inflammation with TLR-Ls, 100 μl PBS containing 100 μg TLR3 ligand, polyI:C (Sigma-Aldrich, St. Louis, MO), and 50 μg TLR9 ligand, CpG1668 (Fisher Scientific, Pittsburgh, PA), individually or in combination, were injected into a tumor. In some experiments, 100 μl PBS containing 50 μg TLR2 ligand, Pam3Cys (Invivogen, San Diego, CA), and 100 μg TLR4 ligand, LPS (Sigma-Aldrich), were injected into a tumor. TCR transgenic hgp10025–33-specific Pmel T cells (29) were isolated from Pmel transgenic mice using magnetic beads (Miltenyi Biotec, Auburn, CA). Purified Pmel cells (5 × 105) were injected i.v. into mice 1 d prior to lv immunization. Abs used in this study, anti-CD90.2 (Thy1.2), anti-CD90.1 (Thy1.1), anti-CD45, anti-CD8, anti-CD4, anti-CD11c, anti-CD40, anti-CD86, anti-FOXP3, anti–IFN-γ, and anti–TNF-α, were purchased from BD Biosciences (San Diego, CA), BioLegend (San Diego, CA), or eBioscience (San Diego, CA). Tumors were collected, weighed, and made into single-cell suspensions. Briefly, 10–100 mg tumor was cut into small pieces and incubated at 37°C for 0.5 h in complete RPMI 1640 containing 1 mg/ml type V collagenase, 1 mg/ml hyaluronidase, and 100 U/ml DNase I. All enzymes were purchased from Sigma-Aldrich. To measure cytokines, cells were stimulated with peptides in vitro for 3.5 h in the presence of GolgiStop (BD Biosciences) and stained for IFN-γ and TNF-α, as previously described (10). Cells were collected using a FACScanto or LSR-II (BD Biosciences). Data were analyzed using FCS Express V3 software (De Novo Software, Los Angeles, CA). For DCs, tumors and spleens were digested with collagenase to liberate DC cells. Briefly, tumor or spleen was cut into small pieces, incubated at 37°C for 0.5∼1 h in RPMI 1640 containing 500 U/ml type IV collagenase, and then made into a single-cell suspension for subsequent staining. For TIDCs, single-cell suspensions were generated from a tumor, enriched on a Percoll column, and then sorted, using a BD FACSAria, based on expression of the CD11c and CD45 markers. The 7-aminoactinomycin D was used to exclude dead cells. Lymphocytes were isolated from single-cell suspensions of tumors using 40% Percoll (GE-Healthcare Bioscience AB, Uppsala, Sweden), as previously described (30). CD8 T cells were further purified using CD8 magnetic beads. Purified CD8 TILs (∼80% of them were Pmel cells) were tested for cytotoxic capacity using gp100 peptide-pulsed EL4 tumor cells as targets in a JAM assay (11). Magnetic bead-isolated Pmel cells (5 × 104) were labeled with 0.5 μM CFSE and then cocultured with TIDCs (5 × 103) previously pulsed with 5 pg/ml hgp100 peptide. Two days later, Pmel cell proliferation was determined, using flow cytometry, according to the dilution of CFSE. Type I IFN within the tumor was measured using an IFN bioactivity assay, as described (31, 32). Briefly, NCTC929 cells were pretreated overnight with serial dilutions of tumor homogenate in the presence of 4 μg/ml anti–IFN-γ Ab (clone XMG1.2; BD Biosciences) and then infected with VSV-Indiana. Infected cells were cultured for 3 d, and viable cells were stained with crystal violet, dissolved in isopropanol, and quantified by light absorption at 595 nm using a plate reader. RNA was isolated from tumors. The level of IL-12 expression within the tumor after i.t injection was determined by quantitative RT-PCR, as we previously described (33). The statistical significance of the experimental data was analyzed using unpaired two-tailed t test and log-rank test (GraphPad Software, La Jolla, CA). TLR3/9 ligands (CpG/polyI:C) have been shown to induce type I IFN inflammatory responses (34, 35). Thus, i.t injection of TLR3/9 ligands would seem to be a valid approach to induce transient and localized acute inflammation within a tumor lesion. First, we studied whether i.t administration of TLR3/9 ligands could enhance the antitumor efficacy of lv immunization. C57BL/6 mice bearing 5-d B16 tumors were immunized with hgp100-lv (Fig. 1A). One week later, when an lv-induced CD8 response was detectable, TLR3/9 ligands were injected into the tumor to induce inflammatory responses. Injection of PBS was used as a control. We found that injection of either TLR3 or TLR9 ligand alone marginally (not significantly) enhanced the antitumor effect of lv immunization (Supplemental Fig. 1A). However, i.t injection of a combination of TLR3/9 ligands markedly increased the antitumor efficacy of lv immunization (Fig. 1B). Approximately 50% of the tumors in the mice receiving lv immunization plus a single i.t injection of TLR3/9 ligands underwent regression, and 30% were completely eradicated. In addition, mice treated with this combined approach survived significantly longer (Fig. 1C). In contrast, although lv immunization alone significantly inhibited tumor growth, it was unable to eradicate a tumor, consistent with our previous data (11). 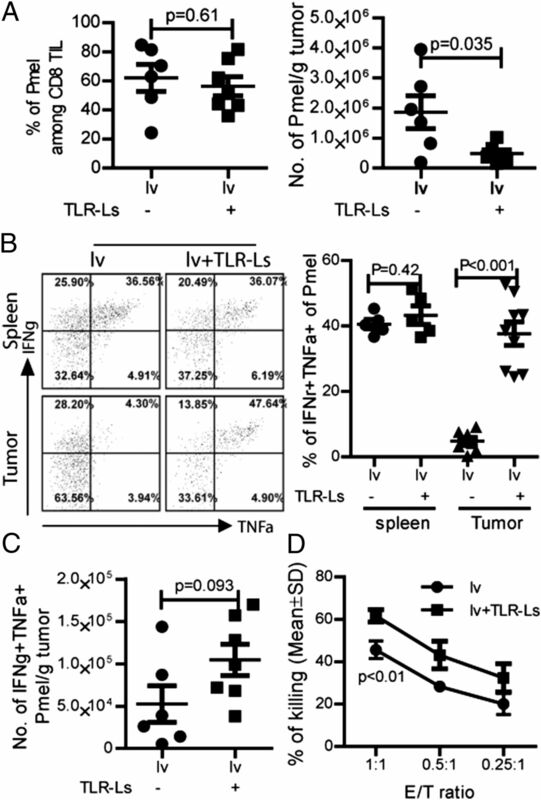 A single injection of only TLR3/9 ligands slightly inhibited tumor growth (Fig. 1B). All of the mice in the groups receiving lv immunization alone or TLR3/9 ligand alone succumbed to tumor growth. I.t injection of TLR3/9 ligands markedly enhances the antitumor effect of lv immunization. (A) Experimental plan: B16 mice bearing 5-d B16 tumors were immunized with hgp100-lv and then injected i.t 1 wk later with TLR3/9 ligands. (B) Tumor growth curves are shown as means. A summary of tumor weights at the end of experiment is based on three experiments. Nonpaired two-tail t test was used for statistical analysis. (C) Survival curve of mice treated with different regimes is shown. Two experiments were conducted with similar data. Log-rank test was used for statistical analysis. The remarkable synergistic antitumor effect of lv immunization plus i.t injection of TLR3/9 ligands prompted us to study immunological changes within the tumor. We speculated that the first reason for the enhanced antitumor effect of lv immunization by i.t injection of TLR3/9 ligands was due to an increase in the TILs. Compared with nonimmunized control tumors, lv immunization increased the absolute numbers of CD4 and CD8 TILs, in agreement with our previous study (11). However, surprisingly, we found that i.t injection of TLR3/9 ligands decreased the absolute numbers of CD8 and CD4 TILs compared with lv immunization alone (Fig. 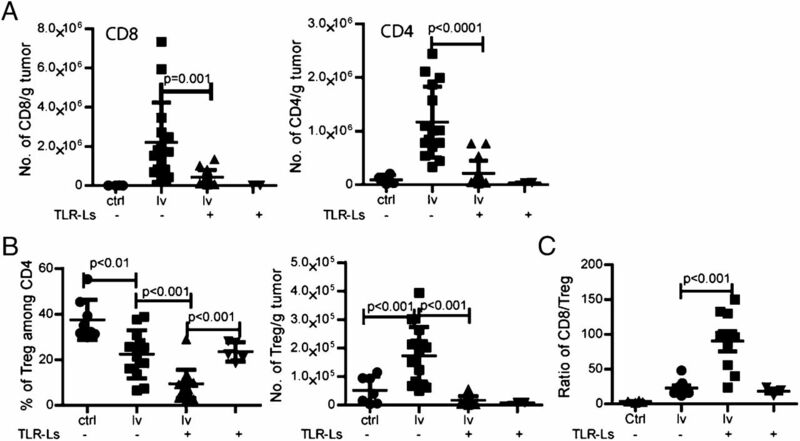 2A), indicating that enhancement of the antitumor effect by injection of TLR3/9 ligands was not due to an increase in the numbers of CD8 and CD4 TILs. However, one consistent observation was that, compared with lv immunization alone, the addition of an i.t injection of TLR3/9 ligands further reduced the percentage of Treg within the tumors to <10% (Fig. 2B). Injection of either TLR3 or TLR9 ligand individually did not further decrease the percentage of Treg (Supplemental Fig. 1B). Importantly, the absolute number of Treg within tumors was also reduced after injection of TLR3/9 ligands. Together, the ratio of CD8 T effector (Teff)/Treg within the tumor was significantly increased (Fig. 2C). The increased Teff/Treg ratio within the tumors following i.t injection of TLR-Ls may play an important role in enhancing the antitumor effect of lv immunization, as previous studies found that the Teff/Treg ratio correlated to antitumor effect (36, 37). I.t injection TLR3/9 ligands significantly reduces the ratio and absolute numbers of Treg within the tumor. (A) One week after lv immunization, TLR3/9 ligands were injected into the tumors. Absolute numbers of CD8 and CD4 TILs were enumerated. (B) The percentage and absolute number of Treg within the tumor were summarized. (C) The CD8 Teff/Treg ratio was calculated from the absolute numbers of CD8 TILs and Treg within the tumor. Data are from three separate experiments. Nonpaired t test was used for statistical analysis. We (16) and others (17, 18) previously showed that the function of CD8 TILs within tumors was severely impaired. We thus hypothesized that another reason for enhancing the antitumor effect of lv immunization by i.t injection of TLR3/9 ligands could be rescue of the effector function of TILs infiltrating the tumor. To test this hypothesis, we first examined the cytokine production of CD8 TILs by intracellular staining for IFN-γ and TNF-α. To gate on tumor-specific T cells and to better characterize the effector function of Ag-specific CD8 T cells within tumors, we adoptively transferred gp100-specific TCR transgenic Pmel cells into the tumor-bearing mice before lv immunization. We found that, whereas the percentage of Pmel cells in tumors did not change, the absolute numbers of Pmel cells within the tumors were decreased by i.t injection of TLR3/9 ligands (Fig. 3A) due to a reduction in the total number of CD8 TILs (Fig. 2A). Importantly, IFN-γ and TNF-α cytokine production by Pmel TILs in the tumors of mice receiving lv immunization plus i.t injection of TLR-Ls was fully restored to the same, or even increased, levels compared with Pmel cells in the spleen (Fig. 3B). Even though the total number of Pmel TILs was reduced (Fig. 3A), the number of IFN-γ and TNF-α double-positive Pmel cells in the tumor was slightly increased by TLR3/9 ligands (Fig. 3C). However, i.t injection of either TLR3 or TLR9 ligand individually did not significantly increase the cytokine production of Pmel TILs (Supplemental Fig. 2). I.t injection of TLR3/9 ligands rescues the effector function of CD8 TILs. The experiment was conducted similar to Fig. 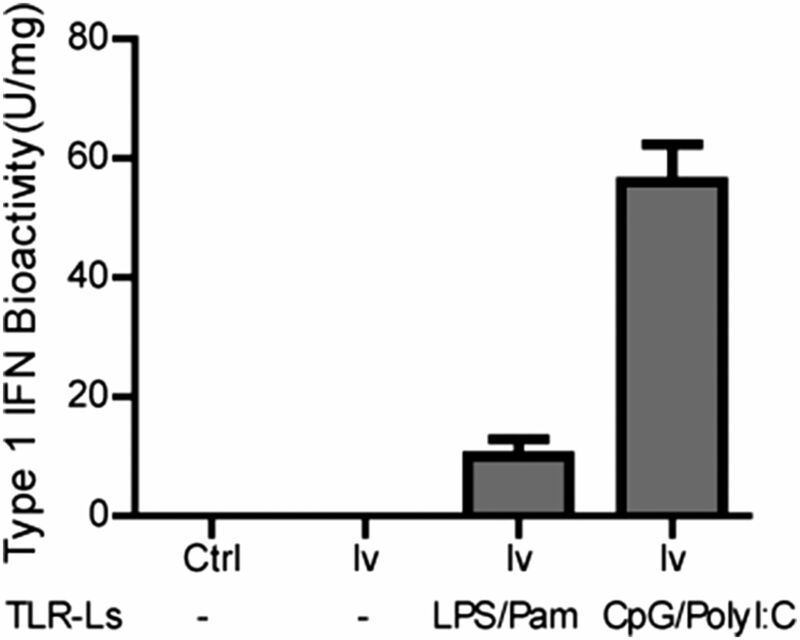 1, except Pmel cells were adoptively transferred into mice 1 d prior to lv immunization. (A) The percentage and absolute number of Pmel cells within the tumor are summarized from two experiments. (B) Single-cell suspensions from spleens and tumors were stained for Thy1.1, CD8, IFN-γ, and TNF-α. Only the Pmel (Thy1.1+) CD8 T cells were gated and were shown in the dot plot. Data are a summation of two experiments. (C) The absolute numbers of IFN-γ and TNF-α double-positive Pmel cells from two experiments are summarized. (D) The data of in vitro CTL assay are shown. The t test was used for statistical analysis at each E:T ratio. Enhancement of CD8 TIL function by i.t injection of TLR3/9 ligands was further studied by examining their cytotoxicity. Our data demonstrated that CD8 TILs isolated from TLR3/9 ligand- injected tumors exhibited significantly higher cytotoxicity (Fig. 3D). Next, we determined whether other TLR-Ls would have similar effects, that is, reducing the percentage of Treg within tumors and restoring the effector function of TILs. To this end, we used TLR2 (Pam3Cys) and TLR4 (LPS) ligands because previous studies had shown that they did not stimulate type I IFN production (26, 27, 38) and did not generate significant antitumor activity (27). Our data show that i.t injection of TLR2/4 ligands did not restore cytokine production of CD8 TILs (Fig. 4A) and did not further decrease the percentage of Treg within the tumors (Fig. 4B) even though acute inflammation (a swollen and red appearance) was observed in the tumors. Not surprisingly, i.t injection of TLR2/4 ligands did not enhance the antitumor effect of lv immunization (Fig. 4C). 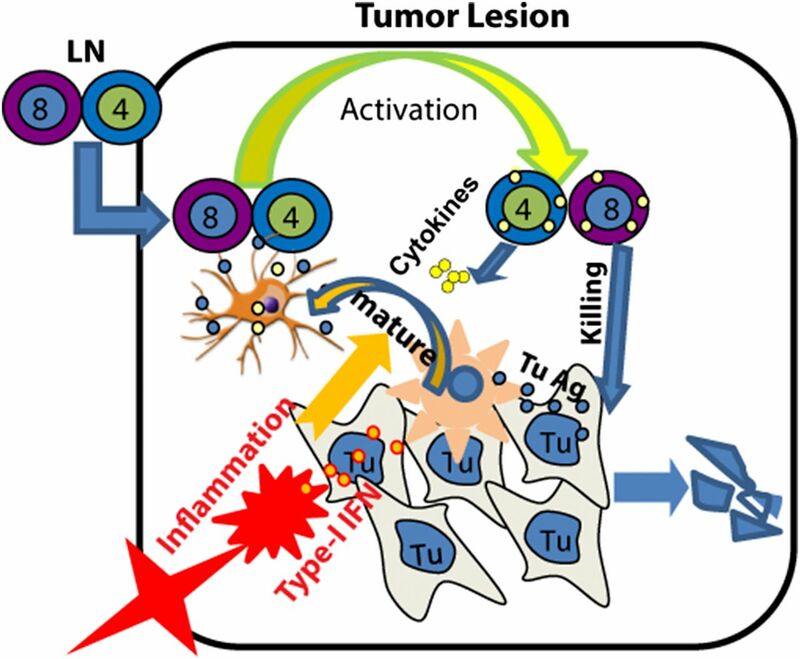 Our data suggest that TLR3/9 activation may result in distinct proinflammatory responses within the tumors that are able to rescue the effector function of TILs. I.t injection of TLR2/4 ligands does not affect the percentage of Treg and the function of TIL. Mice bearing B16 tumors were adoptively transferred with Pmel cells and then immunized with hgp100-lv. One week later, TLR2/4 ligands were injected into the tumor. The percentage of Treg (A) and cytokine production (B) of TILs is analyzed and presented. (C) Tumor weights at the time of sacrifice are presented. Two experiments were conducted with similar results. We next investigated the mechanism involved in rescue of TIL function. Previous reports showed that different TLR-Ls could induce different levels of type I IFN production (26, 27, 38): the type I IFN-inducing TLR3/9 ligands generated strong antitumor effects, whereas the type I IFN noninducing TLR2/4 ligands generated only weak antitumor effects (27). Therefore, type I IFN produced after administration of TLR3/9 ligands may be the key molecule in the rescue of TIL function. To test this hypothesis, we first examined levels of type I IFN within tumors after i.t injection of TLR3/9 or TLR2/4 ligands. We found that injection of TLR3/9 ligands, but not TLR2/4 ligands (LPS/Pam3Cys), could induce high levels of type I IFN in the tumors (Fig. 5), consistent with previous reports (26, 27). Local acute inflammation increases the type I IFN within the tumor. Tumors were collected 1 d after injection of different TLR-Ls. Three tumors from each group were pooled and lysed. The bioactivity of type I IFN was analyzed in triplicate using a biological assay. The bioactivity of type I IFN is shown. To study whether type I IFN signaling was important for the rescue of TIL function, we used IFNαβR−/− mice in which the type I IFN signaling is impaired. The experimental design is depicted in Fig. 6A. We first found that Pmel CD8 T cells could be activated, although to a lesser extent, in IFNαβR−/− mice (Fig. 6B). Approximately 20% of Pmel CD8 T cells in the spleens of IFNαβR−/− mice were able to produce both IFN-γ and TNF-α, compared with ∼35% of Pmel CD8 T cells in the spleens of wild-type (wt) mice. However, i.t injection of TLR3/9 ligands failed to enhance the antitumor effect of lv immunization in IFNαβR−/− mice (Fig. 6C). Furthermore, whereas i.t injection of TLR3/9 ligands rescued the effector function of TILs in wt mice, the same approach failed to improve the effector function of tumor-infiltrating Pmel cells in the IFNαβR−/− mice (Fig. 6D). In addition, i.t injection of TLR3/9 ligands did not decrease the percentage of Treg within the tumors of IFNαβR−/− mice (Fig. 6E). These data suggest that type I IFN signaling plays a key role in the restoration of cytokine production by CD8 TILs and in the decrease of Treg percentage within tumors. Local injection of TLR3/9 ligands cannot rescue the effector function of TILs or decrease the percentage of Treg in the absence of appropriate type I IFN-mediated signaling. (A) The experimental scheme was shown. Both wt and IFNαβR−/− mice were used in the study. (B) The ability to activate Pmel CD8 T cells by lv immunization in the IFNαβR−/− mice is demonstrated by the production of IFN-γ and TNF-α by the Pmel cells in the spleen. (C) Tumor weights at the time of sacrifice were recorded and presented. (D) Rescue of the effector function of CD8 TILs was determined by the production of IFN-γ and TNF-α. Only the Pmel cells were gated and are shown. (E) The percentage of Treg within the tumor is shown based on gating only the CD4 T cells. The experiment was repeated three times with similar results. Two recent studies suggest that type I IFN receptor-mediated signaling in the DCs is critical for generating antitumor effects (39, 40). In one study, Schreiber’s laboratory demonstrated that mice lacking type I IFN receptor (IFNαβR−/−) on their DCs could not reject highly immunogenic tumor cells (39). Thus, DCs are functionally relevant targets of endogenous type I IFN. Dunn et al. (41) found that the relevant target of type I IFN was the host cells derived from hematopoietic cells and type I IFN was required by DCs for immune rejection of tumors. We thus reasoned that appropriate Ag presentation by DCs was required to rescue the effector function of TILs. To further study the mechanisms involved in the rescue of functional CD8 TILs, we investigated the phenotypes and Ag-presenting function of TIDCs following injection of TLR3/9 ligands into the tumors. We found that i.t injection of TLR3/9 ligands markedly increased CD86 and CD40 expression on TIDCs (an indication of DC maturity) (Fig. 7A). In addition, IL-12 production within the tumors after treatment with TLR3/9 ligands was significantly increased (Fig. 7B). However, TIDCs from IFNαβR−/− mice showed no increase of CD86 and CD40 by i.t injection of TLR3/9 ligands even though they may have higher basal levels of CD40 and CD86. No IL-12 production was detected within the tumors of IFNαβR−/− mice. Furthermore, the Ag presentation function of TIDCs from the TLR3/9 ligand-treated tumors was significantly more potent (Fig. 7C). In contrast, TIDCs in IFNαβR−/− mice could not be matured by i.t injection of TLR3/9 ligands and failed to increase CD8 T cell proliferation. These data suggest that type I IFN signaling may play a critical role in the activation of TIDCs to become more capable of reactivating CD8 TILs to exert their effector function within the tumor (Fig. 8). The maturation, cytokine production, and Ag presentation of TIDCs are impaired in the absence of proper type I IFN signaling. (A) One day after i.t injection of TLR3/9 ligands or PBS (control), the maturation phenotypes of the TIDCs in wt and IFNαβR−/− mice were analyzed. TIDCs of control (open) and TLR3/9 ligand-injected (shade) mice were gated and analyzed for CD86 or CD40 expression. (B) IL-12 levels within the tumor after local induction of acute inflammation in wt mice (top panel) and IFNαβR−/− mice (lower panel) were determined by quantitative RT-PCR. Data are presented as fold increases in IL-12 levels over nontreated tumors. (C) TIDCs were isolated from wt and IFNαβR−/− mice 1 d after i.t injection of TLR3/9 ligands. Ag presentation function of TIDCs isolated from different tumors treated with various agents, as indicated, was determined by induction of Pmel proliferation in vitro. A model of how TILs are rescued to exert their effector functions within a tumor. The vaccine-activated and LN-derived T cells require in situ activation by TIDCs upon migration into a tumor. Unlike microbe-infected sites, the TIDCs are functionally suppressed. TLR3/9 ligands in the tumor activate TIDCs through type I IFN-dependent signaling to become effective APCs. The activated TIDCs are capable of acquiring, processing, and presenting tumor Ag to reactivate TILs to exert their functions. In this study, we found that i.t injection of TLR3/9 ligands effectively rescued the function of CD8 TILs, significantly reduced the numbers and percentage of Treg within tumors, and improved the antitumor effect of lv immunization. Mechanistically, local administration of TLR3/9 ligands increased IL-12 level within tumors and induced TIDCs to mature, thereby enhancing Ag-presenting function. These favorable immunological changes, including rescue of the effector function of TILs and increases in Teff/Treg ratios within tumors, are dependent on appropriate type I IFN signaling. For decades, vaccine researchers have paid little attention to the effector phase of immune responses because it has been assumed that immune cells, once activated, will be on autopilot to exercise their function in target tissues. Failure to generate significant antitumor effects by most cancer vaccines, despite the apparent induction of potent immune responses, illustrates the need to study the effector phase of antitumor immunity. Teleologically, vaccine-activated and lymph node (LN)-derived effector cells should remain quiescent during transit to the target organ to avoid collateral damage (42). Upon reaching the target tissue, they will then require stimulation to exercise their effector function. Recent studies in infectious disease models began to shed light on this important issue (43, 44). Wakim et al. (43) found that memory T cell reactivation by DCs in the nonlymphoid tissues was critical to the control of HSV infection. Another study discovered that, after initial LN priming, CD8 T cells needed additional interaction with DCs resident in the lung to develop full-strength immune responses against influenza virus (44). Similarly, in an autoimmune diabetes model, onset and progression of autoimmune diseases (i.e., autoimmune destruction) were determined by the inflammatory status of the target organ (45, 46). Thus, the conventional paradigm that immune effectors will exercise their effector function automatically in target organs may need revision. Reactivation of tissue-infiltrating immune effector cells appears to be required in order for them to exert their effector function. The virus-infected lesion can provide all of the signals required by tissue-resident DCs to function effectively as APCs leading to reactivation of incoming T cells, thus empowering them to exert their effector function. However, the scenario is quite different within the tumor in which Treg and other suppressor cells may inhibit function of TILs, and, as a consequence, TIDCs in the late-stage tumor cannot stimulate TIL (47). The results from our study indicate that induction of inflammatory responses and type I IFN within tumors may create the appropriate environment to allow for TILs to exert their function. Repeated i.t injection of CpG was reported to eradicate mouse lymphomas possibly by direct activation of TIDCs that engender Ag presentation in situ and initiate tumor-specific responses (48, 49). In addition, repeated delivery of polyI:C into tumor led to reactivation of tumor-resident T cells in situ (27). However, it is not clear how the TLR-Ls will affect the effector function of the vaccine-activated and LN-derived TILs. In this study, we found that the effector function of CD8 TILs primed by lv immunization could be rescued by a single injection of TLR3/9 ligands into the tumors (Fig. 3). Type I IFN-mediated signaling was a critical factor in TIL effector function (Fig. 6). TLR2/4 ligands without significant induction of type I IFN did not rescue the effector function of TILs (Fig. 4). We also found that type I IFN signaling was required for TIDC maturation and Ag-presenting function (Fig. 7), in agreement with recent finding that DCs are the relevant targets of type I IFN during lymphocyte-mediated tumor rejection (39). Although we focused on the role of type I IFN on host DCs, activation and expansion of Ag-specific CD8 T cells require appropriate type I IFN signaling on the T cells (50), which may activate cytokine expression in T cells. However, with an intact type I IFN receptor, the adoptively transferred Pmel cells in this study cannot be rescued to exert their function without appropriate signals from host APCs in IFNαβR−/− mice, further suggesting that type I IFN signaling of host cells plays an important role in rescue of TIL’s effector function. The increase of IL-12 production within tumors after TLR3/9 administration may also play an important role in shaping the tumor milieu and generating antitumor effect, as previous studies demonstrated that IL-12 delivery into tumors could initiate regression (51, 52). Based on the current data, we propose a model for how TILs can be rescued and exert their effector function to achieve antitumor outcomes (Fig. 8). To generate an antitumor effect, tumor-specific immune effector cells, activated by vaccines in the lymphoid tissue, need to be appropriately reactivated to exert their function after migration to the tumor. However, the tumor milieu is immunologically suppressive, and the TIDCs are therefore unable to present Ag to reactivate TILs. The importance of TIDCs was further emphasized in a recent study showing that TIDCs could change their function from immune stimulating to immune tolerogenic, resulting in conversion from tumor equilibrium into immune escape (47). Proper function of TIDCs within the tumor was reported to be important in reversing T cell tolerance in situ (53). Local injection of TLR-Ls into the tumor stimulates production of type I IFN, which then activates TIDCs. These activated TIDCs or other innate cells within the tumor produce IL-12 and become effective APCs to reactivate TILs, which together lead to a potent antitumor effect. Type I IFN-dependent activation of TIDCs is probably the most critical step because of its role in rescuing the effector function of CD8 TILs. Recently, several other approaches were found to be capable of activating tumor-associated APCs, leading to an improved antitumor effect. For example, radiation (54) and chemotherapy (55) were recently found to increase the antitumor efficacy of immune cells after adoptive transfer, by increasing the cross-priming capacity of TIDCs. In another study, CD40 agonist Ab was found to activate tumor-associated macrophages (56), which, as professional APCs, may reactivate TILs in addition to killing tumor cells directly. Whether these approaches may result in rescue of the effector function of vaccine-primed TILs is an interesting topic for further study. Recent studies by Sierro et al. (57) have shown that PD1 blockade can increase the antitumor effect of lv immunization. We also found that administration of PD1/PD-L1 Abs was partially capable of rescuing the cytokine production of CD8 TILs (16). Thus, PD1/PD-L1 blockade may further increase the antitumor efficacy of lv immunization and TLR3/9 ligand administration. Tregs play an important role in immune suppression within the tumor. Our data show that i.t injection of TLR3/9 ligands reduced the percentage and number of Treg and thus increased the ratio of Teff/Treg within the tumor. The mechanism of how TLR3/9 ligands reduce the numbers of Treg remains to be studied. However, two studies have shown that Th1/Th2 T cells can inhibit peripheral Treg induction in vitro and in vivo (58) in an IFN-γ–dependent manner (59). Addition of exogenous IFN-γ was also shown to markedly decrease Treg generation in vitro. Thus, it is possible that successful execution of the effector function of CD8 TILs within the tumor increases the level of IFN-γ, which leads to reciprocal inhibition of expansion of Treg. It is conceivable that the rescue of CD8 TIL function of secreting IFN-γ leads to the decrease in Treg within the tumor. In summary, we have demonstrated that loss of effector function by TILs within a tumor can be rescued by local administration of TLR3/9 ligands possibly through type I IFN-mediated activation of TIDCs. Although the application of this approach is limited by the difficulties of accessing each individual tumor, the identification of type I IFN as a critical cytokine in the rescue of TIL effector function points to the potential that codelivery of type I IFN to tumors may contribute significantly to rescue of TIL effector function and increase the efficacy of current tumor immunotherapies. We thank colleagues Dr. Phillip Chandler and Davies Agyekum for editing the manuscript. This work was supported by National Institutes of Health Grant R01 CA16444 and the Distinguished Investigator Fund from Georgia Research Alliance (to Y. He).
. 2004. T-cell epitope peptide vaccines. Expert Rev. Vaccines 3: 563–575.
. 2007. Plasmid DNA and viral vector-based vaccines for the treatment of cancer. Vaccine 25(Suppl. 2): B24–B34.
. 2006. Recombinant viral vectors: cancer vaccines. Adv. Drug Deliv. Rev. 58: 931–947. 2006. Skin-derived dendritic cells induce potent CD8(+) T cell immunity in recombinant lentivector-mediated genetic immunization. Immunity 24: 643–656. 2005. Immunization with lentiviral vector-transduced dendritic cells induces strong and long-lasting T cell responses and therapeutic immunity. J. Immunol. 174: 3808–3817.
. 2006. Induction of effective therapeutic antitumor immunity by direct in vivo administration of lentiviral vectors. Gene Ther. 13: 630–640.
. 2003. In vivo administration of a lentiviral vaccine targets DCs and induces efficient CD8(+) T cell responses. J. Clin. Invest. 111: 1673–1681.
. 2004. Intravenous injection of a lentiviral vector encoding NY-ESO-1 induces an effective CTL response. J. Immunol. 172: 1582–1587.
. 2011. Lentivector prime and vaccinia virus vector boost generate high-quality CD8 memory T cells and prevent autochthonous mouse melanoma. J. Immunol. 187: 1788–1796.
. 2009. Lentivector immunization stimulates potent CD8 T cell responses against melanoma self-antigen tyrosinase-related protein 1 and generates antitumor immunity in mice. J. Immunol. 182: 5960–5969.
. 2009. Melanoma progression despite infiltration by in vivo-primed TRP-2-specific T cells. J. Immunother. 32: 129–139.
. 2004. Cancer immunotherapy: moving beyond current vaccines. Nat. Med. 10: 909–915.
. 2005. Tumor progression can occur despite the induction of very high levels of self/tumor antigen-specific CD8+ T cells in patients with melanoma. J. Immunol. 175: 6169–6176. 2007. Failure at the effector phase: immune barriers at the level of the melanoma tumor microenvironment. Clin. Cancer Res. 13: 5256–5261.
. 2010. Blockade of programmed death-1 pathway rescues the effector function of tumor-infiltrating T cells and enhances the antitumor efficacy of lentivector immunization. J. Immunol. 185: 5082–5092.
. 2008. Rapid tolerization of virus-activated tumor-specific CD8+ T cells in prostate tumors of TRAMP mice. Proc. Natl. Acad. Sci. USA 105: 13003–13008.
. 2011. Exhaustion of tumor-specific CD8+ T cells in metastases from melanoma patients. J. Clin. Invest. 121: 2350–2360.
. 2006. Effector-phase tolerance: another mechanism of how cancer escapes antitumor immune response. J. Leukoc. Biol. 79: 652–662.
. 2007. A cytokine-mediated link between innate immunity, inflammation, and cancer. J. Clin. Invest. 117: 1175–1183.
. 2004. Cancer: an inflammatory link. Nature 431: 405–406.
. 1998. Viral immune evasion due to persistence of activated T cells without effector function. J. Exp. Med. 188: 2205–2213.
. 2005. Type I interferon dependence of plasmacytoid dendritic cell activation and migration. J. Exp. Med. 201: 1157–1167.
. 2008. Targeting the effector site with IFN-alphabeta-inducing TLR ligands reactivates tumor-resident CD8 T cell responses to eradicate established solid tumors. J. Immunol. 180: 1535–1544.
. 2001. Critical role for alpha/beta and gamma interferons in persistence of lymphocytic choriomeningitis virus by clonal exhaustion of cytotoxic T cells. J. Virol. 75: 8407–8423.
. 2003. Tumor regression and autoimmunity after reversal of a functionally tolerant state of self-reactive CD8+ T cells. J. Exp. Med. 198: 569–580.
. 2011. Lentivector expressing HBsAg and immunoglobulin Fc fusion antigen induces potent immune responses and results in seroconversion in HBsAg transgenic mice. Vaccine 29: 3909–3916.
. 2012. Engineering DNA nanoparticles as immunomodulatory reagents that activate regulatory T cells. J. Immunol. 188: 4913–4920.
. 1986. A convenient microassay for cytolysis and cytostasis. Methods Enzymol. 119: 574–579.
. 2012. Immunoglobulin Fc fragment tagging allows strong activation of endogenous CD4 T cells to reshape the tumor milieu and enhance the antitumor effect of lentivector immunization. J. Immunol. 188: 4819–4827. 2007. Development of TLR9 agonists for cancer therapy. J. Clin. Invest. 117: 1184–1194.
. 2010. Toll-like receptor 3-mediated suppression of TRAMP prostate cancer shows the critical role of type I interferons in tumor immune surveillance. Cancer Res. 70: 2595–2603.
. 2006. CTLA4 blockade and GM-CSF combination immunotherapy alters the intratumor balance of effector and regulatory T cells. J. Clin. Invest. 116: 1935–1945. 2006. Regulatory T cells, tumour immunity and immunotherapy. Nat. Rev. Immunol. 6: 295–307.
. 2012. 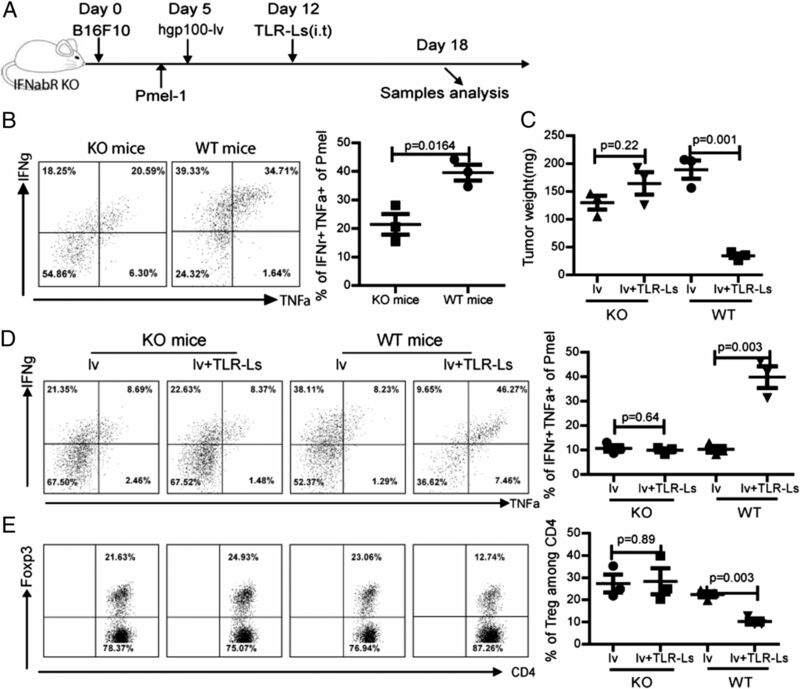 TLR2 signaling depletes IRAK1 and inhibits induction of type I IFN by TLR7/9. J. Immunol. 188: 1019–1026.
. 2011. Type I interferon is selectively required by dendritic cells for immune rejection of tumors. J. Exp. Med. 208: 1989–2003.
. 2011. Host type I IFN signals are required for antitumor CD8+ T cell responses through CD8alpha+ dendritic cells. J. Exp. Med. 208: 2005–2016.
. 2005. A critical function for type I interferons in cancer immunoediting. Nat. Immunol. 6: 722–729.
. 2004. Quiescent phenotype of tumor-specific CD8+ T cells following immunization. Blood 104: 1970–1978.
. 2008. Dendritic cell-induced memory T cell activation in nonlymphoid tissues. Science 319: 198–202.
. 2005. Toll-like receptor engagement converts T-cell autoreactivity into overt autoimmune disease. Nat. Med. 11: 138–145. 2005. A Toll-like trigger for autoimmune disease. Nat. Med. 11: 120–121.
. 2012. Ovarian cancer progression is controlled by phenotypic changes in dendritic cells. J. Exp. Med. 209: 495–506.
. 2009. T-cell modulation combined with intratumoral CpG cures lymphoma in a mouse model without the need for chemotherapy. Blood 113: 3546–3552.
. 2007. Lymphoma immunotherapy with CpG oligodeoxynucleotides requires TLR9 either in the host or in the tumor itself. J. Immunol. 179: 2493–2500.
. 2010. Tumor-resident CD8+ T-cell: the critical catalyst in IL-12-mediated reversal of tumor immune suppression. Arch. Immunol. Ther. Exp. 58: 399–405.
. 2007. Injection of IL-12 gene-transduced dendritic cells into mouse liver tumor lesions activates both innate and acquired immunity. Gene Ther. 14: 863–871.
. 2010. Cutting edge: delay and reversal of T cell tolerance by intratumoral injection of antigen-loaded dendritic cells in an autochthonous tumor model. J. Immunol. 184: 5954–5958.
. 2011. The efficacy of radiotherapy relies upon induction of type I interferon-dependent innate and adaptive immunity. Cancer Res. 71: 2488–2496.
. 2010. Dendritic cell recovery post-lymphodepletion: a potential mechanism for anti-cancer adoptive T cell therapy and vaccination. Cancer Immunol. Immunother. 59: 341–353.
. 2011. CD40 agonists alter tumor stroma and show efficacy against pancreatic carcinoma in mice and humans. Science 331: 1612–1616.
. 2011. Combination of lentivector immunization and low-dose chemotherapy or PD-1/PD-L1 blocking primes self-reactive T cells and induces anti-tumor immunity. Eur. J. Immunol. 41: 2217–2228.
. 2007. Antagonistic nature of T helper 1/2 developmental programs in opposing peripheral induction of Foxp3+ regulatory T cells. Proc. Natl. Acad. Sci. USA 104: 18169–18174.
. 2010. Cutting edge: the Th1 response inhibits the generation of peripheral regulatory T cells. J. Immunol. 184: 30–34.